Temperatures are warming up, baseball season has started and grilling season is just about here! That’s why this week’s Things We Love Thursday is about our favorite brat maker, The Proper Beast! Owned and operated by Brian Hines, The Proper Beast is setting themselves up to be a must-have in the Valley. Recently featured on the Arizona Wilderness Brewing Company menu and used by local food celeb Joanie Simon in one of her food photography classes,The Proper Beast is sure to explode onto the local food scene! How The Proper Beast came to fruition started back when Brian was living and working in New England spending his time each day either commuting on a crowded train or in a cubicle thinking of a way out. To save his sanity, he taught himself how to cook with great resources like America’s Test Kitchen, Food Network, and library cookbooks. Eventually he started a food blog, The Saucy Jalapeño. In 2011, Brian and his husband Thom moved to Arizona where he was working as a compliance analyst. Within a year, he found himself on the phone with HR and the corporate lawyer releasing him from cubicle life, thus pushing gently toward doing what he wanted. It was the moment he was waiting for and he immediately started looking into different food businesses to see where he might fill a need. He didn’t want to be duplicating what was already being done but he knew he wanted to make great food with local ingredients. The Proper Beast began and Thom’s help, they are currently at five farmers markets each week, selling out of two retail locations in Chandler and Phoenix. With their friend Kevin’s help in the kitchen The Proper Beast is slowly growing to meet the demand created by their customers. We discovered The Proper Beast at the Gilbert Farmer’s Market, we were initially drawn by a brat pretzel made by Proof Breads featuring their brats. The following weekend we saw Thom at the Scottsdale Farmers Market (where they sadly no longer have the man power to be at) and purchased our first round of brats. It was love at first bite and a few weeks we returned and bought enough brats for a brat bar at our annual Super Bowl Party. 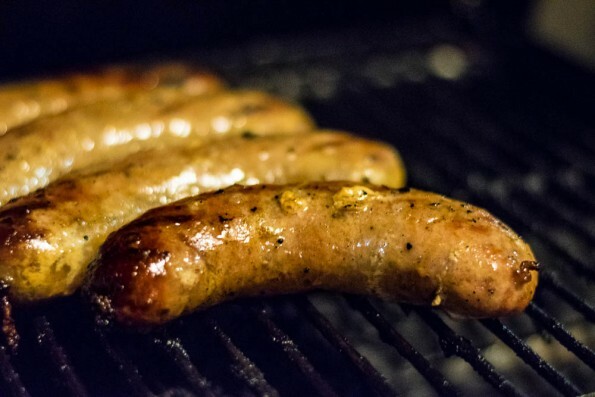 Currently The Proper Beast carries: Bratwurst, On a Bender Brats (a beer brat and our favorite), Italian Sweet Sausage, Italian Heat Sausage, Blinks (breakfast links made with a cinnamon rum apple sauce), and Chorizo (amazing in tacos). They also offer: Beer and Chorizo Dip, Italian Heat Ciabatta, and the Soft Pretzels we mentioned earlier. They can be found at Skysong Community Market on Wednesday evenings, AZ Capital Farmer’s Market on Thursday, Phoenix Public Market and Gilbert Farmer’s Market on Saturday, and Ahwatukee Farmer’s Market on Sunday. The Proper Beast is also carried at AZ Food Crafters and Alaskan Pride Seafood. 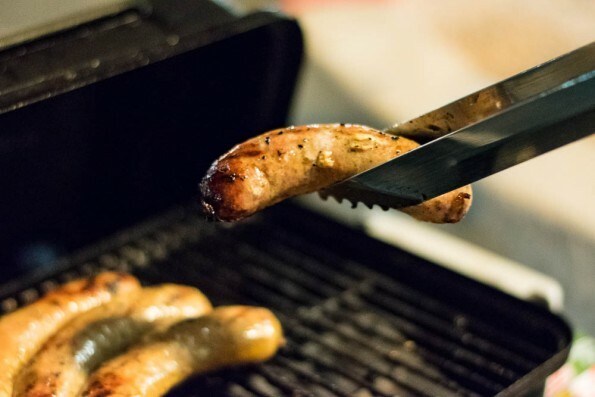 The Proper Beast makes undoubtedly the best brats in the Valley. So much so that we will never buy another brand of brat again! Rumor has it that there are new items in the works! Follow The Proper Beast on Instagram, Facebook, and Twitter for all of their upcoming news! 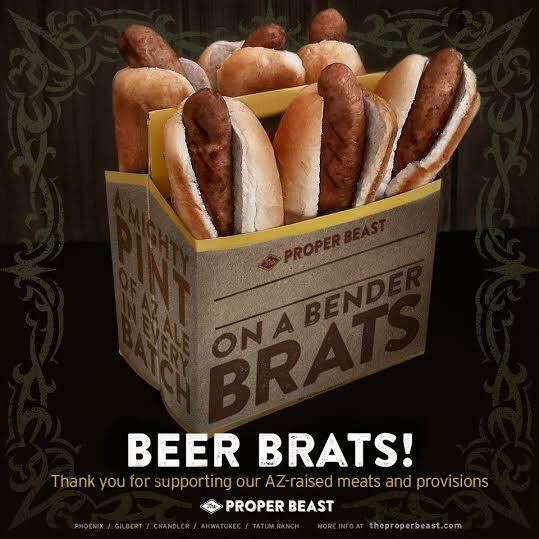 We LOVE brats, and I can’t believe we haven’t tried The Proper Beast yet! We’ll definitely have to add it to our must-try list. Hopefully, we can get some next time we visit Gilbert Farmer’s Market!